The code is definitely downloadable, make sure you turn off all ad-blockers and possibly use Chrome and not Firefox as noticed Firefox does not display adverts so could be the issue. First of all I would like to congratulate you for your article, I think it is a very nice introduction to PID control! But I suggest that you think about using the period of the loop for calculating the integral and derivative terms. D_Term = Kd * (d_Temp – Err_Value)/period. Without using a time reference, your computational methods will not be integral and derivative, but something else. Absolutely, this is just a basic introduction, but it would be best to use a timer to trigger the PID algorithm at a particular frequency and then you can incorporate you code snippet. 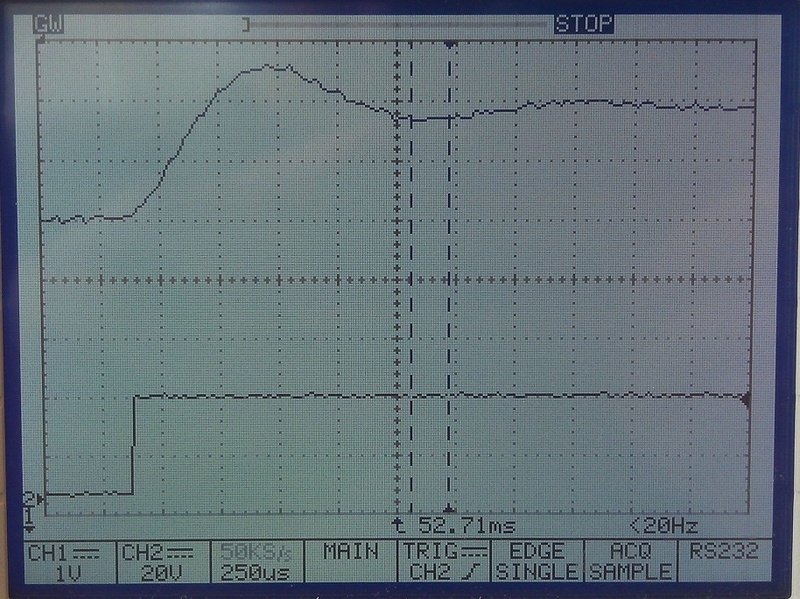 There is a question I would like to ask which is about the picture of step response in oscilloscope. The channel 1 is output voltage of the boost converter right? But based on the channel 1, the volt/division is only 1V / division, so it shows that it is only 2V you get for your output voltage. 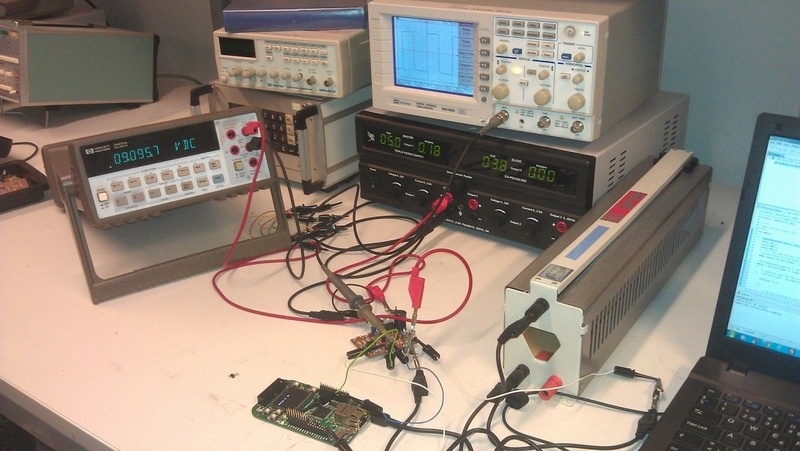 I thought your project is boosting from 5V to 9V ? 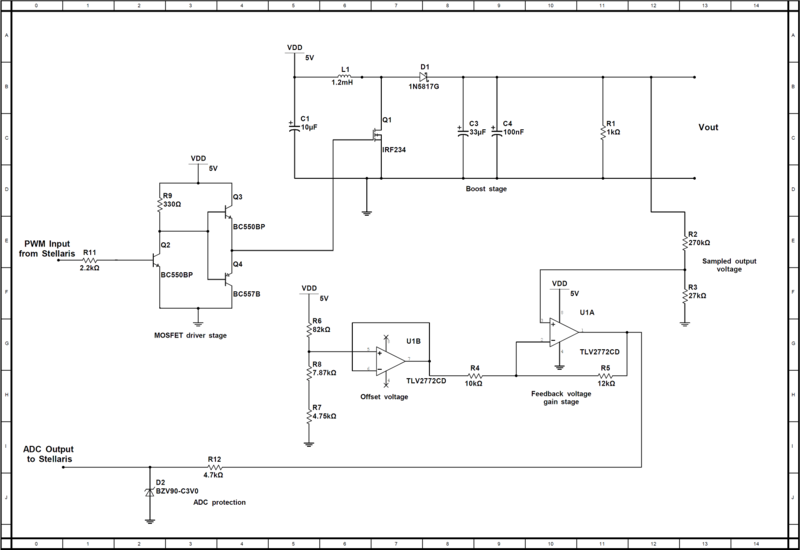 Glad this proved useful, I am working on an updated version of the code based on the MSP430 as well. Fair question, it was awhile now but pretty sure the oscilloscope was connected after the potential divider on the feedback circuit. 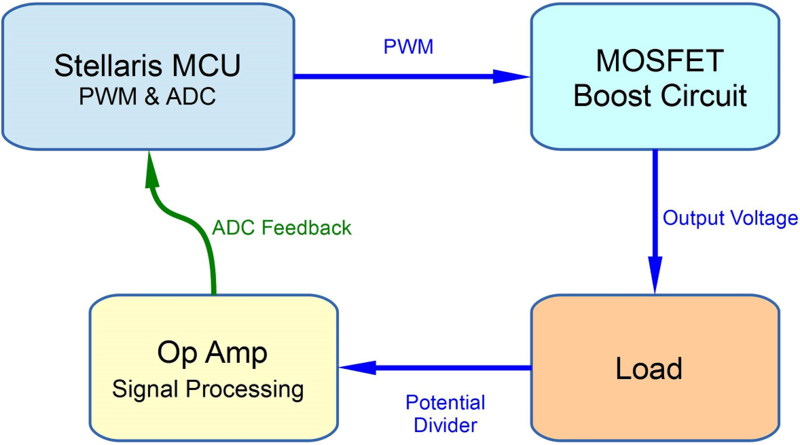 This would then account for the lower voltage, as the potential divider was setup to ensure the sampled voltage was within the 0-3V range of the ADC. Great tutorial, but your code formatting is abysmal. Yep, I have improved my formatting now. Some of the original code uploaded is from when I first started out programming in C.
Also a note regarding the algorithm implementation: shouldn’t variables that save values between function calls (I_Temp, D_Temp) be declared as static? In this case I am using Global variables, if the variables were local to the function it would be possible to use static variables. and in the attached code example it is calculated like this? Glad you found it useful, I wrote this as all the tutorials I found did not break it down into a nice easy example. So I thought this will help others and serve as a good introduction to a basic PID algorithm. When I was writing the tutorial I decided to use variable names that were in-line with the tutorial wording, this way it made more sense and should be easier to understand. The variable names in the downloadable code differ but work in exactly the same way and the calculation is not different, so it should be easy to see the code flow. I was going to change them but simply have not had the time to go through it all. Thank you for quick reply. Well, the fact that make me wonder is that in the article and in the code the calculation is NOT the same: in the article you use new_ADC_value to calculate D_Term, and in the code you use Err_Value (which is Set_Point – new_ADC_value), so the difference is not only in the variable names. Which calculation should be considered correct then? Also, if you don’t mind, please explain, whether it is crucial or not for the PID algorithm to work, to use the PWM_Temp variable (and calculate the PID output previously saved PWM value), or I can just assign the PID output value directly (based only on the P_Term, I_Term and D_Term variables)? Your correct the downloadable code is correct, as the D_Term is the rate of change between the old error value and the current error value, so the tutorial should read (which I have corrected). I needed away to translate the new PID calculation result, to change the PWM duty cycle value. In this case I used the current PWM duty cycle and copied this to PWM_Temp. This allowed for the PID calculation result to either add or subtract from the current PWM_Temp value, the PID result size would be dependant on the PID variables and the size of the error value. This seemed the simplest solution and worked quite well for the tests that were made. 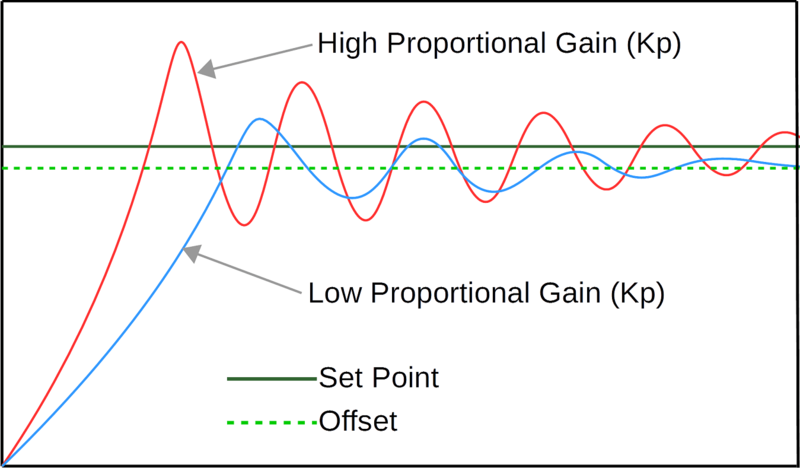 Unsure how you intend to employ your PID, put simply the result from the PID calculation will produce either a positive or negative value depending on which side of the set-point value the error value is. Tnx for the swift reply! I will go through it all and try to use it for my purpose: I have the new Pixy CMUcam5 on my robot and use it in a mode where the X-position of target objects is output with a 0-3.3V analog signal. I want to write my own PI code so I can quickly center the robot w.r.t the middle-point of the target object. This code should be easily portable for your application, and easy to just implement the PI part. Not heard of the Pixy CMUcam5 will have a look into that. And there is no constant float Kd ? Thanks, and yes your right! The constants that are commented out were originally inside the function (as per the software download), I simply left them in as didn’t have time to completely rewrite the code and test it. You need some globals still so data can be retained from one calculation to another. Some of the variables are also named slightly differently, but the structure and calculation is the same. I was writing the tutorial and then decided it would make more sense if the variables followed the same naming convention as used in the tutorial, but I didn’t have time to update all the code and test it again, so kept the original code as is as it works (including the state machine which is not required). I intend to put this all into a typedef struct and add to this existing tutorial, so the code can be ported easily from say a MSP430 to the new Tiva C….time is not on my side! If you have any issue let me know and should be able to resolve them.